It's Tax Day and Grande Vegas Casino is offering some relief by giving 50 free spins on its popular Cash Bandits slot from RTG. "I don’t think anyone really likes paying taxes, but winning $250 on free spins would certainly ease the pain!" said Grande Vegas manager Robert Miller. "Cash Bandit is a fun game and you can win some serious payouts if you spin your way into the Vault." Tax Day Casino Bonus 50 free spins on Tax Day Up to $250 in payouts Coupon Code: TAXDAY Valid April 18 & 19, 2016 only. 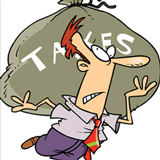 Players can claim their Tax Day relief in Grande Vegas’ download, instant-play or mobile casino. Cash Bandits is a cops-and-robbers-themed slot from Realtime Gaming introduced last summer. Scatters trigger a Vault feature where players try to crack a code and break into a vault full of free spins and bet multipliers. Bonuses for the new rockabilly-themed Big Bopper slot continue until the end of April. Grande Vegas is giving players some free cash and some free spins to try the new game which has bonus features that keep on paying as long as the Bopper is singing. Until April 30, 2016, using coupon code PR-BOPPER, players can claim bonuses up to $300 that include 50 free spins on the new game. Grande Vegas Casino brings a little bit of Las Vegas to computers, smartphones and tablets all over the world, offering hundreds of slots and table games from Realtime Gaming (RTG).